Hermetic Library Fellow T Polyphilus reviews Michael Moorcock’s Elric Vol 3: The White Wolf by Julien Blondel, Jean-Luc Cano, Julien Telo, and Robin Recht. 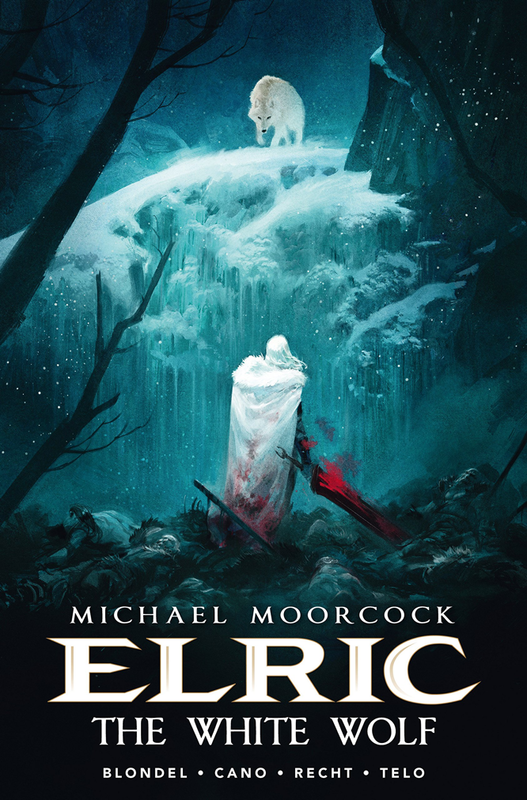 Elric: The White Wolf is the third of the 21st-century French comics adaptations of Michael Moorcock’s anti-heroic sword-and-sorcery saga. The first two came out within a year of each other–at least their English translations did, in 2014 and 2015. But there was a wait of more than three years between the second and the third. I had been deeply impressed by the first two, and I’m happy to report that the third measures up nicely. This volume does lack a foreword (the first two had them from Moorcock and Alan Moore) and for some inexplicable reason, publisher Titan Comics changed the design of the hardcover spine, so that it is not uniform with the earlier volumes. I’m very glad that the publisher is keeping these in a large page-format, rather than attempting to reduce them to American comics-sized pages. The art is still highly imaginative and effective, and the writing continues to reinvent the Elric story in ways that depart from Moorcock’s original telling while only intensifying its underlying spirit. For anyone familiar with the original books, this volume of the graphic series will deliver a real sucker punch of a surprise ending! I hope that whatever trouble delayed this third number has been resolved, and that the fourth will follow apace. 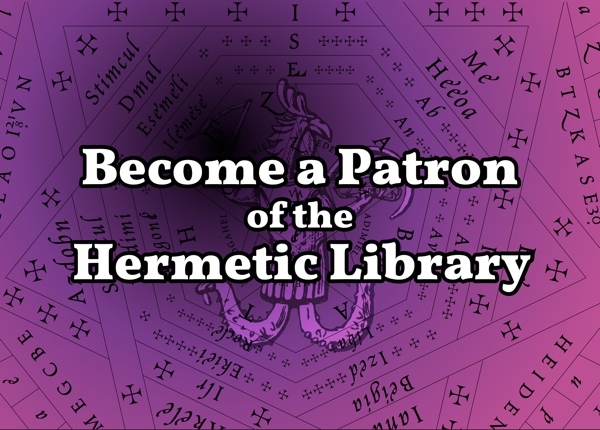 This entry was posted in Hermetic Library Reading Room and tagged book, Jean-Luc Cano, Julien Blondel, Julien Telo, Michael Moorcock, review, Robin Recht, T Polyphilus on March 24, 2019 by John Griogair Bell. 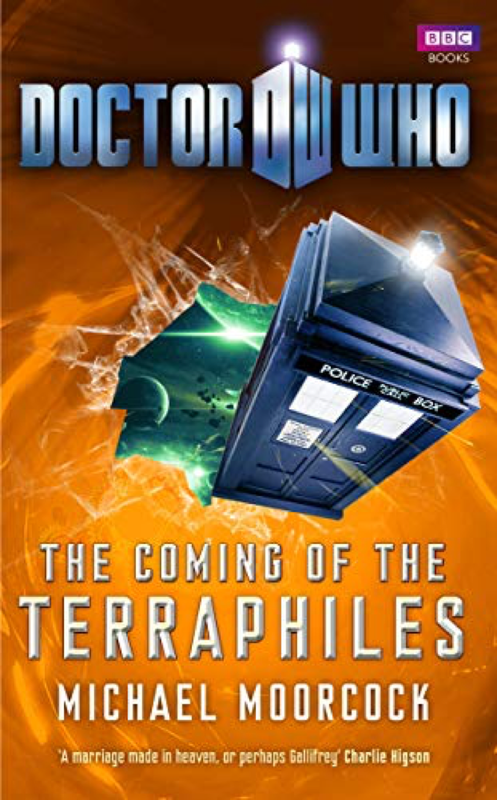 Hermetic Library Fellow T Polyphilus reviews Doctor Who: The Coming of the Terraphiles, or Pirates of the Second Aethyr by Michael Moorcock. Michael Moorcock’s Doctor Who novel has for its protagonists the eleventh Doctor (the one played by Matt Smith) and Amy Pond (but no Rory). The central characterizations are solid, but it doesn’t pick up much else from the Doctor Who narrative other than a couple of references to the Time War and the relatively amicable presence of some Judoon. On the other hand, as the subtitle Pirates of the Second Aethyr indicates, it does connect to Moorcock’s Eternal Champion hyperwork by means of Moorcock’s “Second Ether” trilogy–which I haven’t read. Jerry Cornelius puts in a guest appearance too. I’ve only read thirty or forty of Moorcock’s books, many of them several decades ago, and I felt sure I missed quite a few passing intertextual references. The “Terraphiles” are fans of and competitors in the “Renaissance Tournaments” of the fifty-second millennium, which purport to revive the sports of Old Old Earth, albeit in a quite muddled and relatively unrecognizable form. There is talk about whether a “broadsword” should be more or less than three feet wide. One of the principal games involves cracking nuts with hammers. And there is a lot of archery, with arrows routinely caught by hand. Moorcock supplies just enough description of these events that I was completely stumped at attempting to visualize them. He did manage to communicate the pacing and drama of the competitions, however. The whole scenario of a far-future affection for a dimly perceived human past also put me a bit in mind of some of my favorite Moorcock books, the “End of Time” series, as well as a number of Doctor Who episodes in which interstellar humanity have distorted understandings of their history. In The Coming of the Terraphiles, the multiverse is imperiled by the “black tides” unleashed by a defect of the Cosmic Balance. It needs a component restored to it, and the Doctor is sure that it is connected with the Silver Arrow of Artemis that serves as the trophy for the recurrent galactic Terraphile championships. The Doctor joins the Gentlemen, a Terraphile sporting team, in order to travel with them to the grand tournament. . . . . . . . . . . . . (spoilers – hover over to reveal) . . . . . . . . . . . . . . . . . . . . . . . . . . . . . . . . . . . . . . . . . . . . . . . . . . . . . . . . . . . . . . . . . . . . . . . . . . . . . . . . . . . . . . . . . . . . . . This book wasn’t entirely silly, but it was certainly silly enough. Moorcock didn’t let down Doctor Who, nor did he mess up his own sprawling metatext. Still, I wouldn’t suggest it as an introduction to either. It’s the sort of indulgence that a veteran author should be permitted, but one that really needs an experienced fan to appreciate. This entry was posted in Hermetic Library Reading Room and tagged book, Michael Moorcock, review, T Polyphilus on January 23, 2019 by John Griogair Bell. Last year I read the Oswald Bastable novels by Michael Moorcock, stories of time travel in which the author uses the documentary conceit common to 19th century fantastic fiction and many of the early pulps (especially sword-and-planet yarns from ERB onward): the story is a first person account from a manuscript that has come into the possession of the author. Moorcock’s use of this framing in his Bastable books at first involved his grandfather as an intermediary, and eventually brought “Michael Moorcock” himself closer to the strange events of the narrative. 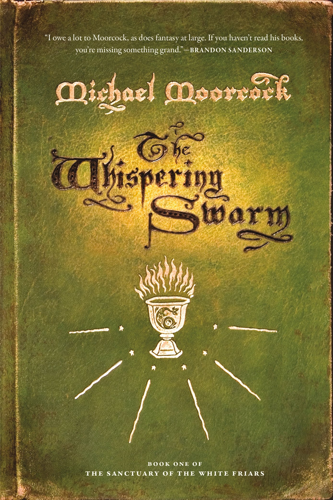 The Whispering Storm is the first volume of Moorcock’s currently projected trilogy, “The Sanctuary of the White Friars,” and it is again fantastic fiction featuring time travel, but now the author’s identity has moved from the penumbra of the fiction into its full shadow. He has brought in so much autobiographical content that the book turns out to be a personal memoir with a fully-developed portal fantasy embedded in it. Set chiefly in London in the 1960s, it features “Moorcock’s” discovery of a secret neighborhood within London, isolated from the mundane world, and opening onto past centuries and perhaps other worlds rooted in fiction. His ability to travel to this Sanctuary and its tributaries marks him as having a native talent for sorcery, which is developed late in the book as events come to focus on a story of 17th-century London at the end of the English civil war. Although I know that Moorcock is capable of deliberate, highly crafted, literary narrative (as well as genre novels cranked out in a day or two), that’s not what I read here. The book genuinely reads like a naive and somewhat rushed recounting, stumbling over sequences and sometimes revisiting details as if they had not been told before, because they all coexist in the teller’s memory. He is a genuinely unreliable narrator in the way that any memoirist must be, with that thrown into relief by the supernatural elements of his tale. He’s made public statements that some of the autobiographical details have been suppressed or altered in kindness to other people, but I had to wonder if the fantasy narrative was a screen for certain of his activities in the period, since his magic involvements seemed to have real consequences for his interactions with his mundane family, for instance. It’s not a blind for illicit drugs in any case, since he at first tries unsuccessfully to blame his experiences on acid, and later claims that his experience with drugs kept him skeptical about the phenomena of his strange travels. The portal adventure uses concepts such as the “moonbeam roads” and “Second Aether” that Moorcock had developed in his later fantasies. If one suspends disbelief according to the account in hand, those would reflect a growing transparency on his part, in which his fiction increasingly reflected his genuine occult experience! While I do think that this book could be enjoyed by those previously unfamiliar with Moorcock’s considerable oeuvre, it definitely will be more rewarding for those who have read in his earlier work. The next volume is supposed to be titled The Woods of Arcady. 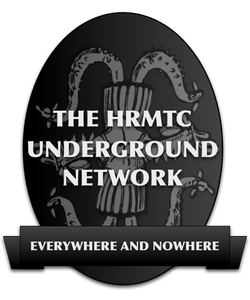 This entry was posted in Hermetic Library Reading Room and tagged books, Michael Moorcock, review, T Polyphilus on September 7, 2017 by John Griogair Bell. Hermetic Library fellow T Polyphilus reviews The Nomad of Time by Michael Moorcock. 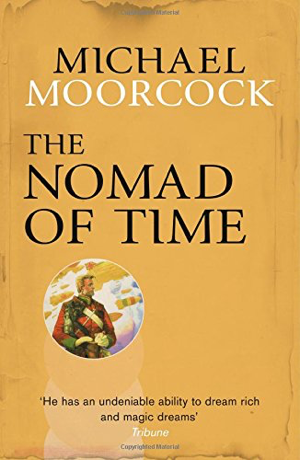 The Nomad of Time is a book club omnibus of Michael Moorcock’s three Oswald Bastable novels. These books first published in the 1970s are sometimes characterized as seminal steampunk, on account of their re-imagining of the technological development of the early 20th century, the conspicuous presence of airships, and the Edwardian character of the protagonist. (Bastable’s name is borrowed from that of a child narrator in several Victorian books by E. Nesbit.) Each of the three novels presents a variant of 20th-century history, in which geopolitical and technological conditions vary. In all, however, Bastable finds himself near the center of critical events concerning global warfare, and he comes to feel a considerable guilty responsibility for his role, although he is more victim than perpetrator. Although the titles may evoke Edgar Rice Burroughs, if these books contain pastiche or homage to another author, it is certainly H.G. Wells, for both the scientific and political elements as well as the period setting. There is a documentary conceit established in The Warlord of the Air, according to which Bastable was an acquaintance of Moorcock’s grandfather, and the first two novels are simply presentations of text found among the papers of the older Moorcock’s estate. The third novel purports to be a Bastable manuscript delivered directly to grandson Michael through a more fantastic agency. In this series, Moorcock gives actual historical personalities new roles in the variant histories that he presents. For instance, in The Land Leviathan Mahatma Gandhi features as the president of the idyllic South African republic of Bantustan. The “Steel Tsar” of the third book is (unsurprisingly) an otherworld variant of Lenin. The Ukranian revolutionary Nestor Makhno is conscripted to serve as a mouthpiece for some of Moorcock’s own Kropotkin-inflected political views toward the close of the third book. The 20th-century event that seems to have the greatest metaphysical significance in The Nomad of Time is the first detonation of a nuclear fission bomb. In fact, the atomic bomb is to this trilogy pretty much what the Death Star is to the original Star Wars trilogy, although Moorcock’s political sensibilities are quite different than those of George Lucas! 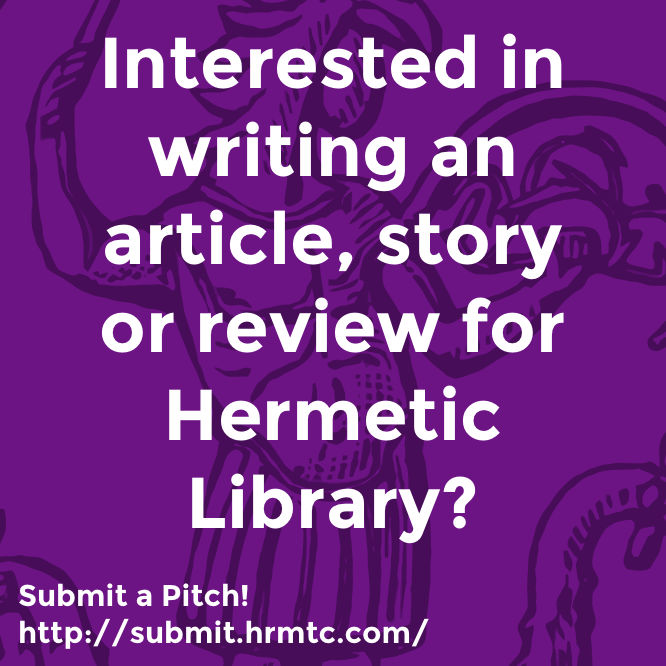 This entry was posted in Hermetic Library Reading Room, T Polyphilus: Vigorous Food & Divine Madness and tagged books, Michael Moorcock, Reading Room, reviews, T Polyphilus on September 2, 2016 by John Griogair Bell.